JUROR: Sharone Putter, award winning artist. The 2019 Juried Irish Art Show is open to everyone 16 or older. All entries must be original works depicting Dublin, OH; Ireland; or the Irish people. Open to any traditional and non-traditional 2D media. Each piece must be no larger than 24”x 24” framed, to allow for up to 20 pieces to be exhibited. Submissions must be the artist’s original work, properly wired for hanging (“saw tooth” hangers will not be accepted). Unframed canvas paintings must have the edges finished. Paintings must be dry to the touch. * Please note- works previously entered in DAAL Spring or Fall shows at the DCRC cannot be accepted. $15.00 for non-members; $10.00 for DAAL members; fee covers up to two works. Fees are non-refundable. Entry fee can be paid by sending a check or online (payment information at the end of this page, after submit button). Best of Show $125, First Place $100, Second Place $75, Third Place $50; Honorable Mention Ribbon, People’s Choice Ribbon. The public will have the opportunity to vote for People’s Choice, until the end of the day on Sunday, August 4. Then the People’s Choice Ribbon will be hung. Art will be exhibited at the Dublin Community Rec Center from Saturday, July 20 through Wednesday, August 21, 2019. All entry files (regardless of type or media) must be named with artwork title followed by the entry number (i.e. Title_1.jpg) Image Size: about 1000 dpi on the longest side. To change the size of your images you can use the following programs: Photoshop, Illustrator, Pixlr , Picasa, and Picmonkey. 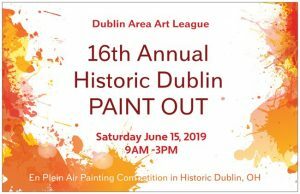 Please submit a short written statement (between 25 and 50 words) with each entry explaining how the art relates to Dublin, Ohio; Ireland, or the Irish people. If it was done at a plein air paint out, or while at a favorite place or event in Dublin, etc.—please tell us. This will be printed on the labels, so please check for spelling and edit accordingly. Include Title, dimensions (including frame), medium, price, contact info(for buyers), artist’s statement. Please do NOT submit links to jpeg files (Google Docs or otherwise). Please attach images directly to email. Your submission will not be complete until the entry fee is received. All work accepted for the exhibition must arrive ready to install. Works not gallery-ready, or not exhibiting good craftsmanship, may be omitted from the exhibit. Accepted work that differs significantly from the entry images or suffers from poor presentation, will be disqualified. All selected work must arrive at the Dublin Community Rec Center by the specified date (see calendar below). Accepted work will remain on display for the duration of the exhibition. Art will be hung at the Dublin Community Recreation Center (DCRC) for display during the 2019 Dublin Irish Festival. All negotiations and transactions are between the artist and the buyer. DAAL will not handle payments or retain any commissions. Tags must include artist’s contact information. Sold artwork should stay in the exhibit until last day of show. Exception: if a piece is sold to a non-local patron, it may be removed by the artist before the final exhibit date, with prior notification to DAAL. Artworks are not required to be for sale in order to be exhibited. Release of Liability: Participating artists must sign the DCRC art show waiver of liability at take-in. DAAL is not responsible for any damage. DAAL will retain the submitted images of accepted artwork and reserves the right to use the images in publications and gallery publicity. Beyond such use, the artist retains full copyright of exhibited work. DEADLINE FOR ENTRIES: Sunday, July 7, 2019, midnight. This program is partially funded by the Dublin Arts Council though a Community Arts Grant. NEXT STEP: pay your entry fees.